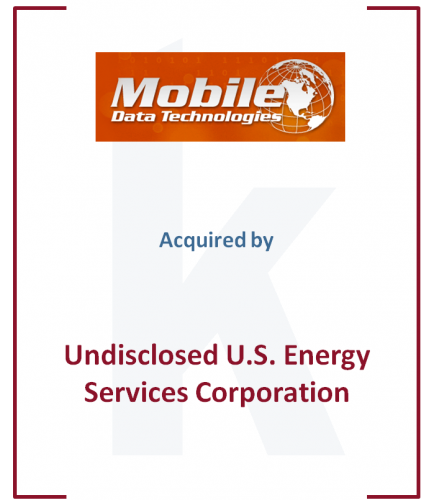 12 December 2013 – The Kirchner Group is pleased to announce the recently completed acquisition of Mobile Data Technologies Ltd. (‘MDT’) by a U.S. energy services provider. Details of the transaction were not publicly disclosed. “Together with Kirchner, we were able to convey the strategic value MDT will bring to the combined entity and as a result, more than doubled our valuation” stated Davis McGregor, CEO of MDT, a leader in data acquisition and control technologies for the energy sector. Kirchner and Company, the M&A arm of The Kirchner Group, acted as M&A advisor to Mobile Data Technologies Ltd. If you would like any additional information on this transaction please contact Lew Turnquist or James Oborne. As we start our 29th year as a company, we invite you to visit our website or contact us directly to see how we may be able to assist you in maximizing the value of your company today.